The scene depicting the two yachts sailing right to left in pursuit of the America's Cup. 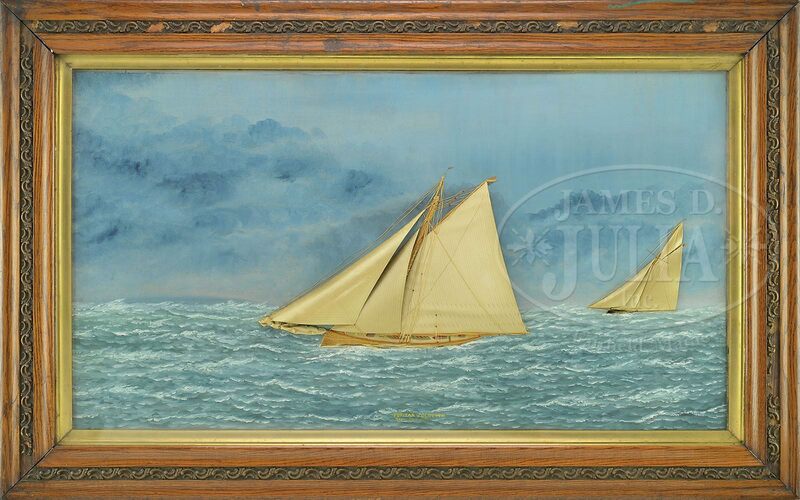 OUTSTANDING SILK, VELVET, AND OIL PAINTING The ocean is shown with choppy white-tipped waves under a blue sky. Housed in an antique oak gilt lined frame with some losses behind glass. At center-bottom written with title "PURITAN & GENESTA SEPT. 24, 1885"
SIZE: Sight: 19-1/2" x 35-1/2". Overall: 27" x 43"